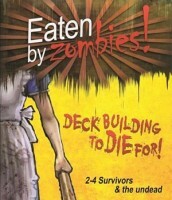 BoardGaming.com> Games> Card Games> Eaten By Zombies! In the game Eaten By Zombies! players strive to survive as the horde of the living dead make it their goal in Death to force you to join the crowd. You must work with or against the other survivors to be the last one standing. No not standing, cowering in the corner crying for their mommy. In the spirit of AMC's "The Walking Dead" and "I Am Legend", Eaten By Zombies! takes you into a dark world of eventual death. Every turn you must venture out from your safehouse and scavenge for Swag. But not so fast, the Undead have other plans for your brains. Every day a Horde of fresh zombies will be waiting for you, and over time the threat gets greater. Now it's time for your "Fight or Flight" instincts to help you to survive just one more day. Using the swag you've got on you (ie cards in you hand) you must survive any way you can. It is the 1950’s and Eisenhower is president, rock and roll music is sweeping the country and zombies have come back from the dead to eat the living. This is the subject of the newest game from mayday games called Eaten By Zombies! But is this card game one that you should pick up or should you avoid it like a pack of flesh hungry zombies? You start the game by selecting one of four characters June, Bob, Barney or Mary and each of the core cards are themed to your character. As you are hiding your safe house you have managed to scrounge together some items that will help you. There are big sticks (which give you +1 to fight), hide (giving you +1 to flee) and sandwiches (that give you +1 to flee but you can draw a card). You get 12 cards in your deck and you will shuffle this deck and draw six cards at random. At the start of your turn you will shuffle the deck that contains the zombie cards and place a card face up. Then you can decide whether you want to fight the zombie or flee as you have to match or exceed the value of the fight or flee values on the card. If you fight the zombie it is removed from play but if you flee you can outrun the zombies but you will lose half the flee value of cards from your hand. If you fail to fight or flee you must discard the amount of cards in your hand equal to the hordes flee value. But either fighting or fleeing you can scavenge cards to put them into your hand and how you do this is by how many cards you played to defeat zombies. For example: if you discarded five cards you can purchase two cards that cost 3 and 2 or one card for 5. The only way to win the game is to be the last one left alive and in a 2 player game that is fine. But in a 3 to 4 player game that might be a bit harder and if you die in a 3 to 4 player game you come back as a zombie and have a chance to add zombies to the deck. The game is really fast paced and fun to play and has some great card art to get your players in the mood. This is a great game as it is simple to play with two players as it is with four. And to make matters better there are scenarios included in the back of the instruction manual where you have certain loot cards on the table. What I love most about this game is the box as it looks like an ammo box and it fits all the cards snugly in the case so it’s easy to store and retrieve the cards for play. This is one of the most fun games to play as you can stab your friends in the back and the price is $25.95 which for a card game is not that bad. For more information on this game including on where to buy go to http://maydaygames.com/ and get ready to get eaten by zombies! But who will be the last to survive? That’s the question in Eaten by Zombies. This is a deck-building game with a twist. Some new mechanics threw us the first few times we played, such as not discarding your entire hand at the end of your turn; you keep whatever cards you decided not play and then refresh up to the base six cards. You don’t take what you purchased and put it into the discard pile for later use, you put the item directly in your hand for use on your next turn. The mechanics definitely make the learning curve a little higher for seasoned dbg-ers, but……. Draw a zombie. Then, the basic strategy is: Should I fight or run? If the latter, you’re going to lose an item from your hand or deck, meaning it goes into the items pool where others could purchase it, whether you successfully get away or not. Hey…you run, you drop something. The question is, how much will you lose? If the former, you might gain some zombies in your hand that can be played on others. Ah yes! Screw your fellow survivalist by setting more zombies on them! You can do one or the other (fight or run)but not both. And the value of the fight or flee cards played are what might be able to be used to purchase something. Might, because if you lose a battle or you run, you don’t get to purchase anything that turn. The cards are extremely high quality and the artwork on them is fun and fanciful…and sometimes slightly gory, but not anything that is inappropriate for kids over 10. Yes, this turns the deck-building genre on its ears. But for seasoned dbg-ers, it will take a couple of plays before all the differences kick in. Once they do, this ’50s-style horror film homage will become a regular part of your gaming night. Add a Review for "Eaten By Zombies!"